The University of Wisconsin men’s basketball team (12-6, 4-3 Big Ten) upset No. 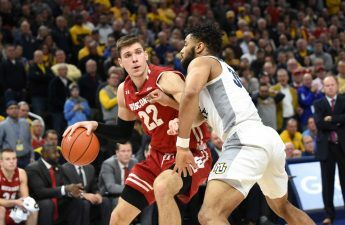 2 Michigan (17-1, 6-1) 64–54 at the Kohl Center Saturday, handing the Wolverines their first loss of the season and their first loss since the 2018 NCAA Championship Game against Villanova last April. The upset win sparks hope in the eyes of Wisconsin fans for a team who had lost four of its previous five games, including an embarrassing loss to Western Kentucky and a dramatic overtime loss to Purdue. 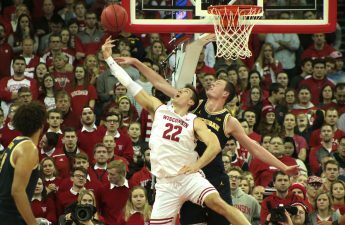 Wisconsin battled hard throughout the game, never allowing Michigan to lead by more than five points, but the Wolverines prevented the Badgers from pulling away until late in the second half. In what could be described as an instant classic, Saturday’s contest featured 26 lead changes and eight ties, including the go-ahead basket by Ethan Happ with 7:35 remaining in the second half. Happ had yet another monster game, finishing with 26 points on 12-for-22 shooting, 10 rebounds, seven assists and two steals, all of which were team-highs. The game marks his 12th double-double of the season — good for the second most in the country — and the 42nd of his historic Badger career, the second most in program history. The senior has now had at least 10 points, 10 rebounds and five assists in eight games this season, while no other player in the country has had five such games. Sophomore Aleem Ford and redshirt freshman Kobe King each knocked down two threes each, and sophomore Nate Reuvers added nine points and two blocks, including the game-sealing dunk after a Zavier Simpson turnover in the final minute. Perhaps the biggest story of the game was Wisconsin’s defense, which was able to hold the Wolverines’ potent offense to just 54 points. Michigan had averaged 73 points per game this season before being held to a season-low by the Badgers. Ignas Brazdeikis, the Wolverines’ leading scorer, finished the game scoreless in just 23 minutes of play after averaging over 15 points per game over the first 17 games of the season. 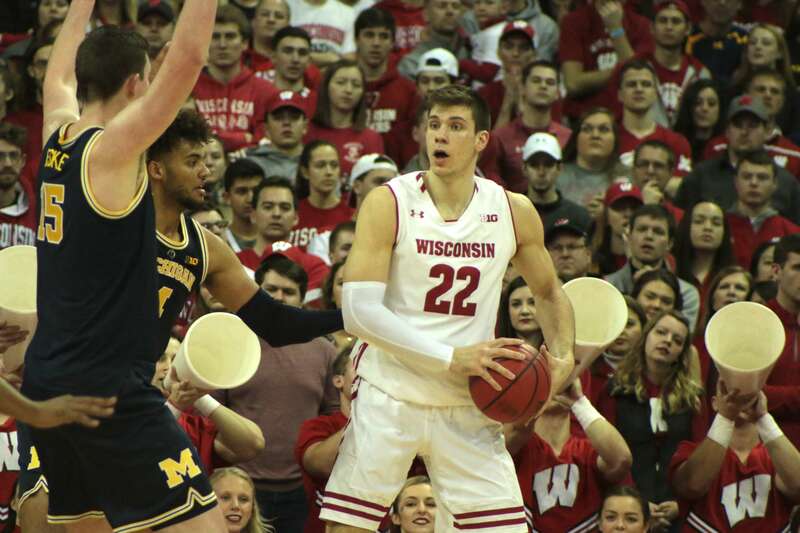 Jon Teske led the Wolverines with 15 points while Jordan Poole added 14 points in front of a hostile Kohl Center crowd. Fans rushed the floor after Wisconsin capped off the historic upset with two Brad Davison free throws, ending Michigan’s unbeaten streak. The Badgers are now 9-5 against top-10 teams at the Kohl Center since the 2009-10 season. Looking ahead, the Badgers will take on Illinois in Champaign, Ill. Wednesday night followed by a home game against Northwestern Saturday. The tip against Illinois is set for 8 p.m., and the game can be watched on the Big Ten Network or listened to over the Badger Radio Network.